Aging also brings changes on skin structure leading to a rarefaction of elastic fibers, alteration and decrease of collagen fibers, reduction of blood microcirculation and hydration. Production of collagen can be induced at any age, but it is much more difficult to stimulate formation of new elastic fibers. The skin no longer manufactures elastin (which represents 90% of the elastic fibers of the dermis) after 40 years of age. Consequently, our stock of elastin decreases as we age, making our skin thinner and losing its smoothness and elasticity. A clinical study was conducted with the objective of evaluating the efficacy of a cream containing 1.6% of Juventide™ on skin firmness and elasticity, versus a placebo. 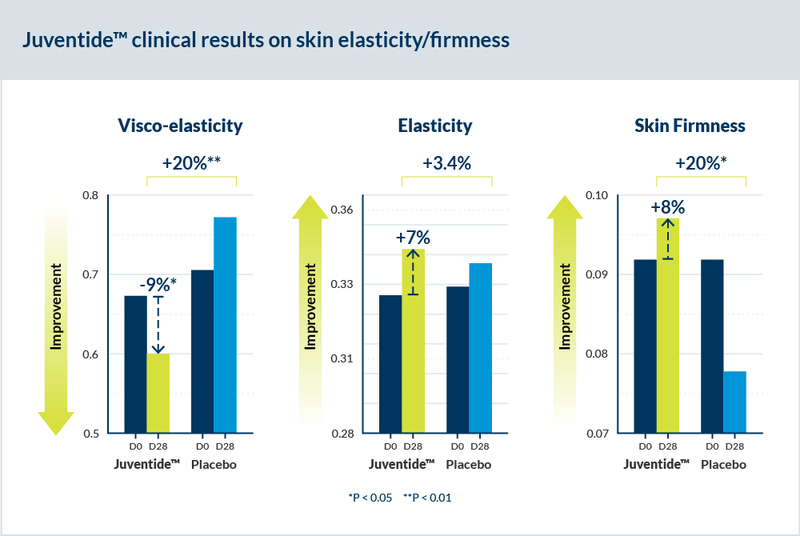 After only 28 days of application, we observed a significant improvement in skin elasticity and firmness compared to placebo.